On November 18, 2006, Serge Savard takes his place among Habs legends when his No. 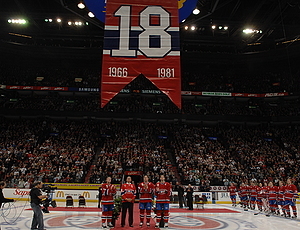 18 is retired by the Canadiens. One third of the Habs' famous “Big Three” on the blue line, Savard patrolled the Montreal blue line for 15 seasons, the last two as captain. A true example of perseverance and determination, Savard raised the Stanley Cup eight times, a league record among NHL defensemen that still stands to this day.